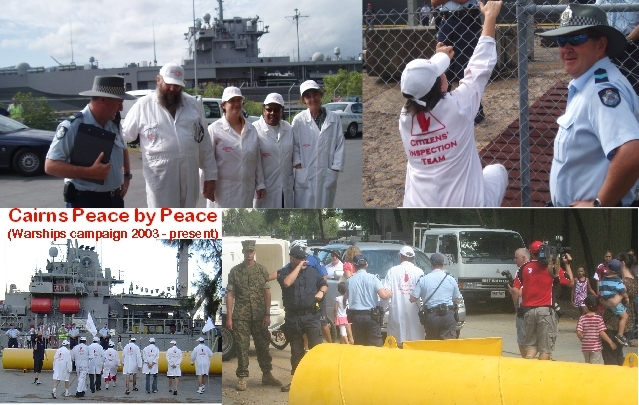 Cairns Peace by Peace has sustained a direct action campaign against the visit of US warships for eight years. I’m expecting to spend the rest of my life in prison. Naturally I’m reflecting on my time here in Cairns. How I came to Cairns. Praise be to CAFNEC! 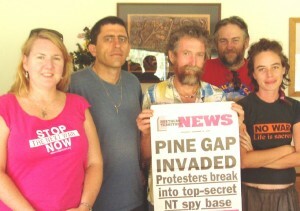 I arrived in Cairns in 1993 to work for CAFNEC as their “energy campaign coordinator”. I was at Cominos House to see the end of the Tully Millstream Hydro Electric Project. I was instrumental in the decision NOT to run mains electricity into Cow Bay and Cape Tribulation. I ran efficiency and industry promotion campaigns under the rubric “Powering the Future”. It all went pretty well, but dealing with bureaucrats all the time, yuk! We waged a glorious last-minute campaign against Skyrail. It was expensive, and turned acrimonious. I was sued twice in 1994 – once in the District Court by the Cairns Post, and once in the Supreme Court by Skyrail Pty Ltd. Eventually I burned out. I learned to say of the CAFNEC Management Committee: “They only have two rules. Work miracles overnight. Don’t take any chances.” Some folk grew to really dislike me. CAFNEC parted company with me. My great reward from CAFNEC was being introduced to Cape York Peninsula, and all of the different peoples who live there. I found my wife independently, yet it’s also a package deal. Margaret Pestorius toured Cape York Peninsula with me in 1994. We decided to marry. We also decided to become allies to Aboriginal people. (We do that by: (i) supporting the positive program health, education, empowerment and (ii) interrupting attacks against Aboriginal people. ) We do it all still. Margaret, Bryan, and Joseph at our wedding reception at Freshwater Lake 4 July 1998. 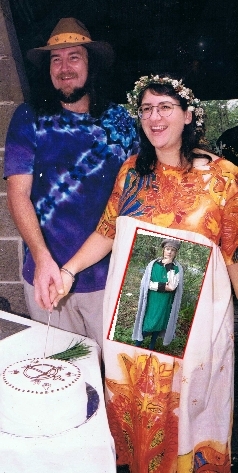 If you want nostalgia, take a look at the wedding photo. Margaret is a good Catholic, but I preferred then to identify as Pagan, and you can find a whole bunch of pagan imagery in the cake and wedding dress. Our son Joseph is there too. Margaret is about 5.5 months pregnant. Pagans and Catholics CAN get along just great. Our son Joseph, fruit of our marriage, is 12 years old. In the pic he’s a Mediaeval Alchemist. He’s 12, and having a lot of fun. For all of the time I’ve been in Cairns I’ve had a vocation. I share Gandhi’s vision of a nonviolent heaven on Earth. I have personally experienced the power of satyagraha, the “truth force” that Gandhi says will aid us in the quest for social justice through nonviolence. Environment, Reconciliation, Peace, and Social Justice are bound together in a social package that citizens must learn to manage sustainably. Democracy is the tool through which the citizen can work. Margaret shares my vocation, and is a far more skilled and conscientious worker in her field than I will ever be. Margaret ran People for Reconciliation 1995-98. Margaret now works as a mental health professional for the Royal Flying Doctor Service. For communities in Cape York Peninsula. (The positive program). For most of the time I’ve been in Cairns I’ve also had a job (the vocation doesn’t pay so well). I drove taxis (which doesn’t pay so well either, but something). Taxi driving is easy, and a lot of the time it can be fun. It gave me a real good look at who lived in Cairns, and how they worked and played. Cairns is OK, but it has a real problem with racism. 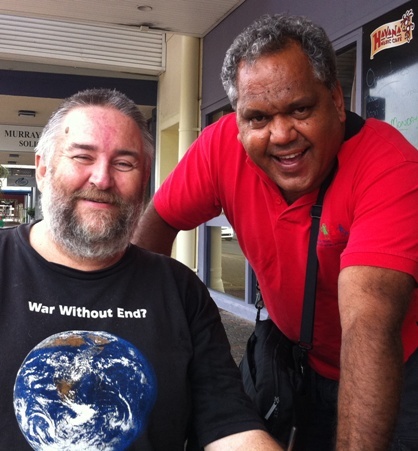 At a Cairns Cafe, you can run into Noel Pearson for a yarn. Desley said all during the election that she was happy with her golden Tiara. After the election I was charged, convicted, and sentenced. What a spoil-sport she turned out to be. First things first! Anyone who knows me knows that I would chew my own feet off and eat them raw before I’d give the ALP a single penny. I don’t see the need to chew my own feet off just yet. In sworn testimony in august 2009, ALP figure Col McKenzie claimed the sole value for which the ALP sought compensation lay in the signs’ availability for re-use if Desley ran in the 2012 Queensland election. 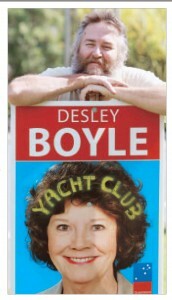 Mr McKenzie swore in his evidence that Desley Boyle WAS likely to run again in 2012. 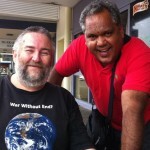 Outside the Court, Col spoke with me about his own hope to be the ALP candidate to replace Desley in the 2012 election. 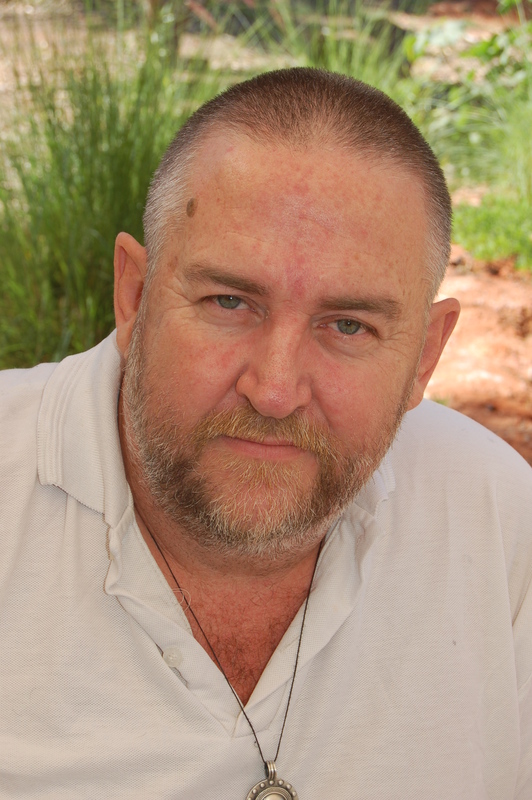 Col McKenzie’s lies (under oath) in the Magistrate’s Court has cost me my driver’s authority, job, and $10,000 in lost wages. Shouldn’t Col McKenzie face criminal charges for perjury? Still, I’ve also found that I quite like not working. It sure frees up a lot of time. Shame about the income but hey, you can’t have everything. I’m beginning to think that I’m already retired from my job. So I can deepen my vocation. I’ve been lucky enough during my career in nonviolence to experience many sublime moments in which I beheld God’s grace. 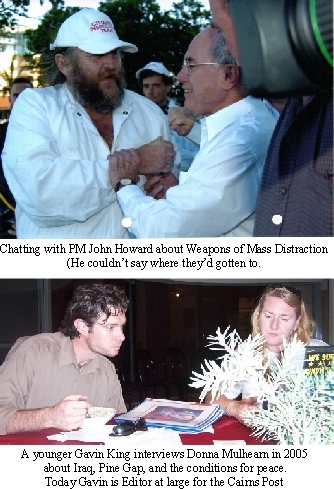 Before I came to Cairns I helped organise the blockade of logging on Fraser Island in 1990. I camped on Fraser Island for three months doing civil disobedience actions. It’s a very beautiful place, rich in wildlife, and I was present (albeit locked in a paddy wagon) when the logging on Fraser Island stopped forever. The noise went away and the day became brighter. In 1994, with Warren Entsch and David Byrne, we jointly composed a resolution to the Cattlemen’s Union in Coen that led to the Cape York Heads of agreement. It was a breakthrough moment that wilted afterwards [The Wilderness Society. Bloody bureaucrats. typical]. 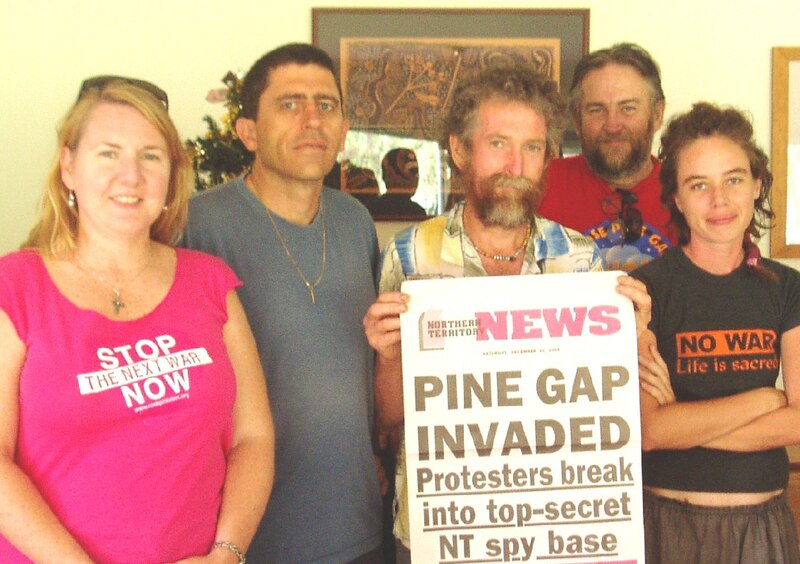 In 2005, with friends, I broke into the central compound of the US Pine Gap Spy Base in central Australia, near Alice Springs (murder capital of Australia). At dawn. The desert sky, the red earth, and the blue uniforms of the dozens of AFP officers who’d failed to stop us getting in. 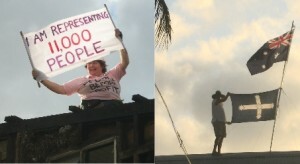 I saw Di Forsyth and Terry Spackman climb up on the roof of the Cairns Yacht Club in 2008. In 2009 I swam in Trinity Inlet with the USS Blue Ridge, bushwalked at Shoalwater Bay during Exercise Talisman Sabre (temporarily delaying a US Marine’s armoured transport column), and got into the secure area of Cairns dock during a visit by the USS Salvor. 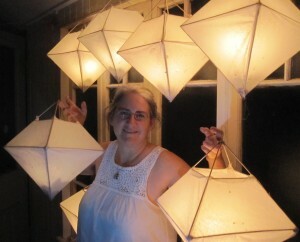 Margaret had already done it in 2006, but I got closer to the gangway. Sailors had to scramble. 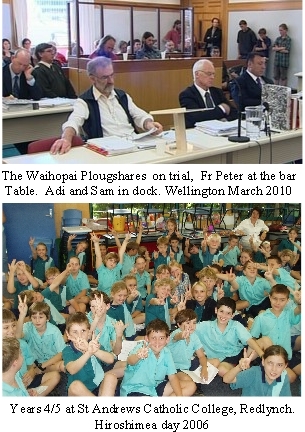 I was standing in the press gallery at Wellington District Court in 2010 when the Jury found the Waihopai ploughshares “Not Guilty”. Each of these moments give me hope. They show me that the oppressive/military state is NOT all powerful. They prove that an ordinary unarmed citizen acting out of love can temporarily bring militarism undone. Margaret illuminates the ANZAC Eve peace vigil we're holding on Easter Sunday/ANZAC Eve 24 April 2011 at the Cairns Cenotaph. What could a dozen, a hundred, a million peaceful purposeful souls bring about on Planet Earth? How do we get there? How do we do it? Why is this so appealing to me. Is it a call? 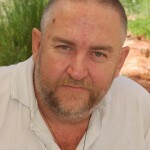 I leave on May 6 to prepare in Rockhampton. The ploughshares action will take place in July. Margaret and Joseph face some harder times without me, and I ask all who know them to help out where you can. Companionship, transport to school, gardening, invitations to a social life, that sort of thing. They are both very rewarding people to know. I look around me now and the physical space is just how I like it. I have a very comfortable life. 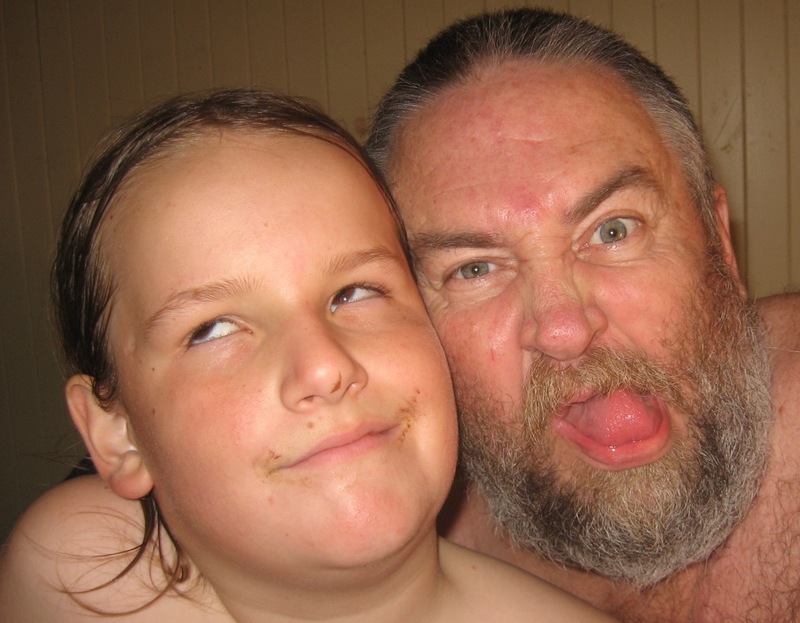 I love my family to pieces (subject to occasional difficulty/annoyance). I hold a lesser, yet still strong love for digital electronics (the add-on of life) and the capacities of technology at our disposal today. Sometimes I can’t quite believe I’m going to make it all so much more problematic by going to prison. For those of you who haven’t been, prison’s a pretty shitful place to be. But if you look below the comfortable surface, life out here is pretty very shitful too. Our nation, in our name, is hanging out with the Americans in Afghanistan, Libya, Pakistan and Iraq – doing evil. Committing murder against some of the poorest tribal people on Earth. What if you were this man? What would you feel? Would you find forgiveness or vengeance in your heart? The blood of murdered children is on our hands. 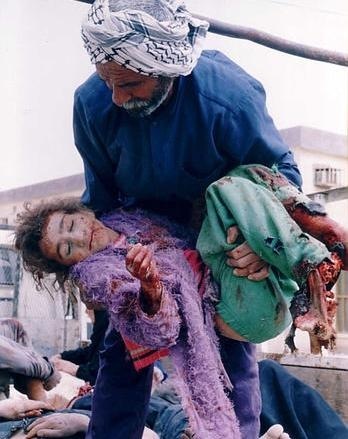 Our foreign policy murders children every week. It’s unacceptable to maintain a life of comfort and ease in the face of such evil. I’d rather be in prison for resisting. If 1% of the population felt the same way, and decided to make a personal witness, war would be over and Isaiah’s prophecy would be fulfilled. Come to my going away party if you like. It’s on Thursday 5 May 7.00 pm at the Boathouse, James Cook Colonialist University, Smithfield. The Boathouse is the reconfigured remnant of the Cairns Yacht Club (one of the “glorious failures” of nonviolence in Cairns). Good luck and Thankyou Bryan! Good friends and understanding be with you all the way of your chosen journey.